Let’s take a glimpse into the newest version of the game to play on your mobile device: Star Wars, Galaxy of Heroes. The game allows players to collect Star Wars characters and create teams to fight battles across the galaxy. Player loving these series will easily recognize some of the famous characters like Luke, Princess Leia, Darth Vader or Han Solo and so on. Players may also engage into battles and become one of the fiercest bounty hunter or hunt down and kill Jedi in the galaxy on the Player vs. Player ladder or the Galactic Conquest by defeating their rivals. The main Cantina lobby will offer you lots of options as you’ll discover soon. The Cantina is a clean and spacious lobby that gives you plenty things to do. For instance, Artoo-Detoo droid who is serving drinks. Looking on your right or left on the screen, you’ll be able to find some extra areas, i.e. the Challenges or the Galactic Conquest. This last section, the Galactic Conquest, unlocks when you’ve reached LvL 40. This mode will allow you to make use of all the characters from one team every time you select the survival/endurance mode. It is essential that you plan carefully every step during the mission since your team members may be disabled due to healing. The next section, Squad Cantina unlocks when you’ve reached LvL 28 and provides its very own stamina in order to complete the missions herein. You will be able to create one team by choosing characters from each party. This section will allow you to farm your character shard/s and money altogether. The dedicated subsection will give you a deeper insight. Shipments constitute groups of items which you can acquire one time every 6(six) hours and after that these will change regardless. These items may differ in the supplies of equipments or materials specific to your level of training mods. For each of these items you can pay in gold or even gems, therefore this is the key to understanding which is worth to buy and when. You might, for example, acquire the limited equipment first and waive all other since the training droids have been very well equipped. At lower levels it is easier to get the gold, but remember that as you go further on it will become increasingly harder to obtain it. Data Cards allow you to make acquisitions inside the application. You’ll be able to use various options and rewards. Also, in accordance to the character level you may be able to unlock a variety of bundles. Further information is available on the IAP item below. The “Main Plot” in this game consists of following Missions in the Light Side or the Dark Side of the Force. During these battles you need to choose which side you’re on, teams from the good side or the dark one, respectively, and fight various missions in order to unlock the character shards together with new equipments. These battles become generic in time and you’ll end up spending the greatest amount of stamina on Sims and in auto-battle. Here you may spend several gems as it will cost you only 50 gems to take a refill on own stamina or you can obtain 20 Sims. The Sims allow you to complete the battles without truly fighting them, unless you have obtained 3stars early on. Every now and then, the degree of difficulty will increase and you’ll be forced to retreat in order to upgrade your gear. The word is that difficulty increase rapidly on Missions 4-L on the Light Side as a result of a bug, but the good news is that efforts are being made in order to fix the bug very soon. Combat is smooth and animations are neat and reliable in this version. Count Dooku and his Force Lightning by itself would certainly deserve to be bought. Challenges represent every day missions rewarding a great deal of items. Trouble may come when engaging in the missions without adequate characters. Each unique event might make you gain Training Droids or Gear, and Mining Droids. Within the subsection of the Challenges you’ll find further details and also get notification whenever new challenges are available. 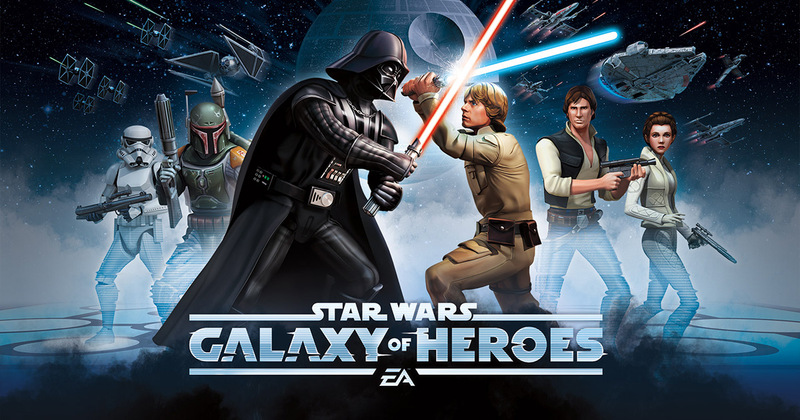 Star Wars: Galaxy of Heroes is an honest mobile app and an entertaining game to play. Nothing is too over-the-top or too exciting but the content of this Star Wars is very rewarding. If you’re interested only in the PvP dominance then purchasing this game is fair enough. The items at the Cash Shop may be considered somewhat expensive or pure luck. First 3(three) bundles will cost you nearly 120$ in total, all the thrill is in its characters. So, fans all over the world these series will not disappoint you. At first you may feel overpowered by this game and all notifications entering your inbox. But no need to worry! Below you’ll find advice on how to carry on with your daily activities and how to advance in the game. ALL your daily activities must be completed – By doing so, you’ll acquire great amounts of XP and Rewards. All you need to do is to complete your daily tasks! You’ll get each day a free 400+ XP. Make use of your energy judiciously! – Just control your characters to see what their needs are before engaging in each mission. Your interest should be not only in getting XP(Experience points) but also in upgrading your characters’ equipment. The XP(Experience points) is identical for all the levels, which it allows you to enroll in any early mission you desire to obtain the things that you need. You may also engage in missions that grant you the desired character shards. Also, you may battle the missions that give you upgraded gear a level in advance for your main team and so when reaching at LvL 40 to the Galactic Conquest where all characters will be needed, don’t be concerned about not having all of them properly equipped. Drain all of the Cantina Energy (on LvL28) – Use the energy in the Cantina to engage in new quests or grind for your wanted character shards. By doing it each day, it can surely get you character shards+5 or even approx. 15k Gold. Upgrade the abilities of your characters – Make use of upgrades for ability acquired in the Cantina, and the challenges to upgrade the best abilities for your strongest characters. Engage in all the battles of the Arena – Arena battles will reward you Arena Tokens, and in turn these may be used to purchase characters ranked high from the Arena Shipments, and Gems every day. Try to get higher in the rankings at this stage. These Tokens and the Gems will get you lots of power which will help you create the best team for you. If you do all these daily activities every day, then you’ll become among the greatest and most powerful bounty hunters in the Galaxy of heroes. Jabba the Hutt may agree with me on this one. In this section, you’ll be presented with in-app purchases and opinions on them and cash shop. The cash shop offers currency in the game and the progression shortcuts. Also, you can get here bundle packs which have rare items, under a time limit rule. These bundles are connected to the character levels. When reaching a particular level, you’ll receive a message of time-limited offers to buy from Data Cards Star Wars: Galaxy of Heroes Store within 10 days. You can choose from 4 bundle packs. At first you’ll be notified about the cheapest pack and then, as you carry on in the game, the other bundle packs will appear. As a player you might be somewhat compelled to acquire the first offer and then the more expensive ones. You may feel that these expensive IAPs purchases do not worth your money and that they do not add value in return. You may also consider that the bundle packs and the Gems are not too rewarding. For each pack you may get one character or shard/s useful to unlock your character. Players may acquire a 30$ for the Chromium packs, but then see themselves getting with 3-stars or 4-stars or worse to 1-star or 2-stars or barely being able to unlock one character. Don’t access a character that you already own because it will be turned into pieces. Our advice to you is to choose carefully! One may also check out our guide regarding the rerolling when feeling the need to select from the start his favorite characters. Monthly Gem Pack for 4.99$ – It’s a standard 4.99 in-game currency for one month. Day 1 will get you 300 gems and additional 100 Gems for the following 21 days. You may feel neglected since you only receive 20 odd days. 3 stars Dooku Starter Pack for 4.99$ – Top Level PvPer(Player vs. Player). Here is a strong acquisition. Count Dooku is more of a beast with a consistent counter-attack and is marvelous for his stun, especially against Jedi. Thus a great plus to your team, while the bundle pack gives you some bonuses, i.e. 500 Gems. 4 stars Assassin Droid Bundle for 24.99$ – You’ll get you a 4 stars HK-47, 3 stars IG-88 and 1 star, shard/s, training droids and 100.000 Credits. This may not be the greatest purchase for you since the majority of the Top-Decks in Star Wars: Galaxy of Heroes is using strategies or teams based on Jedi/Sith. Droid synergy has improved. But it doesn’t work well when used with Dooku Starter pack. Also, the tank HK-47 can do some serious damages, therefore you might want to check for further details on characters making sure it pays off before actually purchasing it. 4 stars Jedi Starter Bundle for 39.99$ – It includes a 4 stars Mace Windu, 2 stars Jedi Knight Guardian, shards and training droids and with 300.000 Credits. Jedi Master Mace Windu is a strong character even if this may be all there is to this pack! Even if is a great bundle it comes at a price. And it does not include the Gems. You may consider it if you want to rank up on the Leaderboard in Star Wars or you might want to trade your Gems for packs and open several 3 stars or 4 stars bundles. 4 stars Heroine Starter Bundle for 49.99$ – It comes with 4-stars Barriss Offee, a 3-stars Asajj Ventress, a 2-stars Ahsoka Tano “Snips”, 1-star Nightsister initiate, character shards, training droids and 350.000 Credits. Here is the greatest pack so far and you’ll get some awesome characters with it. Barriss Offee is a very powerful and skilled female and a noted healer, Asaji is skilled in physical combat while Ahsoka Tano is a great master of the Force and a very skilled in lightsaber combat fighting. To become competitive you might want to get Bariss. She has some the best HP(Health-Points or Hit-Points) in this game. With this expensive pack you’ll have the opportunity to win some battles in the game, but you get no Gems at all. This is a good buy for the aspiring leaderboards. Being quite new and due to its actual prices, this game offers F2P bundle packs which is recommended to those playing under a budget and the micro-players. The majority of the players are very cautions when chasing money at the Cash Shop, while players on top of the ladder, in general, may have one bundle or even a single 3-stars or 4-stars. In order to get more value from this game, you must reroll accounts till you have a 4 stars + starter pack and get the best IAP. As mentioned above, Gold is the rarest resource in Star Wars: Galaxy of Heroes. So, you need to be very careful on the early stages since it will become increasingly harder to level your characters. But, there’s no time to worry! Plan it wisely and use your experience to get Credits or Twi’leks. Selling Items – Here you are able to sell any of your additional items even though you may not get much out of them. Click on the icon Sell Items placed under the icon Characters and select by value. Have fun! During battles in the galaxy, you’ll accumulate mods or gear to equip some of your characters in particular. Initially, this may be overwhelming since you don’t really know how to do it. Don’t worry tough, you’ll soon master this too! Every character starts with Gear LvL 1 which then is updated to the next level. At first, by filling the slots the equipment update appears in the stats in blue as bonuses to your right. But then, after moving to the following gear level, that character will obtain these stats permanently by absorbing the gear. IE, A character in Gear LvL 1 gets +100 HP bonus from his gear. Then, by filling each slot and leveling him, the character will become Gear LvL 2 and a permanent 100 HP(Hitpoints) added to the base stats. You must choose with great care every character since its training and equipment will really deplete your already scarce supply of Gold. This is the best way tough to get stats other than XP(Experience Points) or promotion. These missions are genuine and will consume most of your time every day. After choosing which side you’re on, you need to draw the strongest team for you and engage in battles in every level in order to unlock equipments and character shards. The best thing about Star Wars: Galaxy of Heroes is experience is the same at all the levels, 1(one) stamina equals 1 XP(Experience Points). This is a plus, since your focus will be on leveling and purchasing what you need without climbing in the rankings to other players. As previously mentioned, during hard missions you may have the p to drop 1(one) character shard for their own character and be challenged 3(three) times each day without having to spend any more shards. Those missions are rewarding Stamina+12 instead of the ordinary Stamina+6. Also, they are very resilient in comparison to their normal counterparts. Manage with care your day-to-day stamina use. Initially, stamina refill is 50 Gems, and that is a good acquisition if you want to get more experience. Plus, it will bring you 20 Sims which you may use to save you the trouble of farming the equipments needed by your characters. Engage in hard missions first every day in order to unlock the characters as this is very time-consuming depending on each player’s luck. Then, you may concentrate on those levels having the gear which is consistent with your characters. Each mission will bring training droids, so you don’t need to worry about not getting enough. These Challenges consist of missions to engage into on a daily basis, and subject to each mission you may engage in each more than one time. But there are special requirements, i.e. the STR Gear Challenge where you can use characters having the attacker traits. These missions are easy to complete and reward very handy items, such as training droids or limited equipment. Below there are some challenges and time of their occurrence. The Squad Cantina unlocks when reaching LvL 28 and it has its internal stamina bar. This is a great plus to your leveling battles. When you’ve unlocked this, you’ll get extra XP(Experience Points). Here is best for you to farm your character shards since you can access them insofar as you still have the stamina. The majority of these levels will get you character shards useful to unlock your newest characters and also can get 1K of Gold every time. This is the place to best refill stamina at least one time every day. It pays off to select the best members of your Star Wars fleet for you to complete these missions. You may choose the leaders having good partnership with both parties and use the support characters to counter-attack the members the enemy teams. Those battles are harder than the ordinary missions, and can be pretty challenging if unprepared. Here you’ll get better rewards than those from standard missions. Moreover, you’ll gain Cantina Credits that you can use to enhance your character’s abilities. Pay attention cause you can purchase them only once on each refill. Manage them carefully! You may spend your Cantina Credits exclusively on the ability materials since the shards are not too inviting at this stage. And when considering purchasing several new characters, you might consider Ahsoka Tano and the very wise Daka. You will not regret it! What’s vital in Star Wars: Galaxy of Heroes as in most games within this category is the PvP(Player versus Player) aspect. You rank up on a ranking system based on a ladder and have the possibility to get various rewards on each level. You are given the option to whether control your battles on a manual mode or by using the auto-battle mode. You will fight another team defending itself against the other players. Several shortcomings have been highlighted in the ladder-based system in Star Wars: Galaxy of Heroes, but not for long. Those who have just entered the game will be faced with a great disadvantage. Firstly, you get only 5(five) attempts to the ladder each time, and even though you drop 100$ or 200$ at the Cash Shop and have an enormous higher power number than the players ranked way above you, you’ll be allowed only to fight the battles for that many ranks beyond. IE, to get from rank 100 to rank 7 will take you more than 5(five) attempts as you’ll be able to battle only 15-35 ranks up even though you may have more power than all the players ranked up to the 6th spot. That means you need to trade few hundred Gems to obtain your actual ranking very quick. Otherwise, it would make no sense to challenge the other players. Furthermore, when defeated by another player challenging, instead of losing a rank you may trade ranks. That means you can drop from rank 7 to 80 and other players not playing for days maintain their ranks intact since nobody is attacking them. And a few unlucky challenges can really set you back on rankings. Every day you’ll be rewarded for your actual Leaderboards ranking. These rewards may be useful to purchase shards for some characters in particular. Aim high since the most valuable are the characters requiring 80 shards. Rewards are pretty nice but considering the time and the expenses needed to rank up on the Leaderboards, it is recommended to die-hard exclusively for the most intelligent of Jedi or the most maleficent of Sith. The Galactic War holotable unlocks when reaching at LvL 40. It’s a pretty great endurance and survival mode granting you the possibility to use any of your additional characters victoriously. You’ll battle through 3(three) levels each time to unlock one Chest after every battle won. You may face some challenges since your characters may not be properly healed after every battle while refreshments will not be available for long. Every day, you’ll get only one chance to complete the whole map. However, players may continue the battle until its last character has been defeated. Even though you may have lost the battle, just remember that both teams have suffered injuries, and also you’ll be able to re-challenge them by using any of your characters who are still alive. In order to win, the trick is to initially begin with a decent backup team and battle against the teams on the inferior levels. Then, halfway through the game you will most probably have to change tactics and swap to your strongest characters. It’s also highly recommended to have some healers within your fleet which can really make a difference. Enemy teams might initiate with starter characters, such as Chewie and then include in 1(one) or 2(two) of their finest characters as they progress. Others may choose Obi wan or Darth Maul for their starting lineup. So, take time and plan every battle prudently and this will easily get you several rewards daily. After a few battles, you will get War Tokens to be used into yet another exclusive shipment Store for purchasing additional characters. It is particularly recommended to work your way towards Luminara Unduli for those of you not having already a strong healer in their team. May the Force work for you!